Industrial protective footwear market includes safety footwear used for worker’s safety across various industries such as construction, manufacturing, oil and gas, chemicals, and pharmaceuticals among others. Rise in the number of worker accidents coupled with the implementation of strict regulations are major factors driving the market currently. The market is expected to witness robust growth as the impact of these regulations is expected to increase in the coming years. This report has been segmented by application and by country. The study highlights current market trends and provides the forecast from 2014 to 2020. We have also covered the current market scenario for industrial protective footwear and highlighted future trends that will have an impact on demand. By country, the market has been segmented into, i.e., Russia and Turkey. The present market size and forecast until 2020 has been provided in the report. The report also analyzes macro economic factors influencing and inhibiting growth of the industrial protective footwear market. The others segment including agriculture, government usage, unorganized sector and small scale manufacturing utilities, is the largest application segment for industrial protective footwear in Russia. However, manufacturing is the fastest growing application segment for industrial protective footwear in Russia. The manufacturing segment was valued at USD 46.4 million in 2013. However, among the major application segment of industrial protective footwear in terms of volume, oil and gas held the largest share valued at 0.86 million pairs in 2013. Apart from this, the average selling price for construction segment was highest valued at USD 108.06 in 2013. Among the major application segments, manufacturing held the largest market share. However, the food segment valued at USD 15.0 million in 2013 is the fastest growing application segment for industrial protective footwear in Turkey. The average selling price for industrial protective footwear in the others segment was the least valued at USD 39.22 in 2013. Apart from this, government regulations are present in this region which acts as restraining forces for the new entrants to these markets. Apart from this, there are most favored nation rates and sales tax and other duties which are to be followed compulsorily by foreign manufacturers. Major industry participants include Jal Group (Italy), Rahman Group (India. ), Saina Group Co. Ltd. (China), Oftenrich Holdings Company Limited. (Taiwan), Cofra Holdings AG (Switzerland), Red Wing Shoe Company Inc. (U.S.) and Timberland LLC (U.S.) among others. Industrial protective footwear market includes safety footwear which are being used to ensure worker safety across various industrial segments such as construction, manufacturing, oil and gas, chemicals, and pharmaceuticals among others. Implementation of strict government regulations along with increase in the number of worker accidents are major factors fuelling the demand for industrial protective footwear market currently. The industrial protective footwear market is expected to see robust growth over the forecast period due to the impact of the stringent government regulations. This report has been segmented by application and by country. The study highlights current market trends and provides the forecast from 2014 to 2020. We have also covered the current market scenario for industrial protective footwear and highlighted future trends that will have an impact on demand. By country, the market has been segmented into two regions Russia and Turkey. The present market size and forecast until 2020 has been provided in the report. The report also analyzes macro economic factors influencing and inhibiting growth of the industrial protective footwear market. Russia and Turkey are the major markets for industrial protective footwear globally. Rapid industrialization and increasing awareness about workplace safety are the major factors fuelling the demand for industrial protective footwear in these countries. The usage of industrial protective footwear across agriculture, unorganized sector, government usage and small scale manufacturing utilities held the largest market share in Russia. However, among the major application segments for industrial protective footwear, oil and gas held the largest market share in this country. Apart from this, the increasing industrialization and investments for new business utilities is also boosting the demand for industrial protective footwear in the construction segment. Italy and China are some of the major exporters for industrial protective footwear to Russia. However, new business utilities have to comply with certain government regulations and duties in order to sell their products in the local markets. These regulations are mentioned as tariff and non-tariff barriers. The manufacturing segment is one of the largest application segments for industrial protective footwear in Turkey. The increasing awareness for workplace safety in the automobile manufacturing and ship building facilities is one of the major factors boosting the growth for industrial protective footwear in Turkey. However, due to rapid industrialization and increasing foreign investments the construction segment is expected to see robust growth in the forecast period. The Most Favored Nation (MFN) rates and sales tax are the major barriers for new business utilities to sell their products in the local markets in Turkey. Moreover, there are certain government regulations which are mandatory for foreign manufacturers. These regulations are covered under the non-tariff barriers to trade. 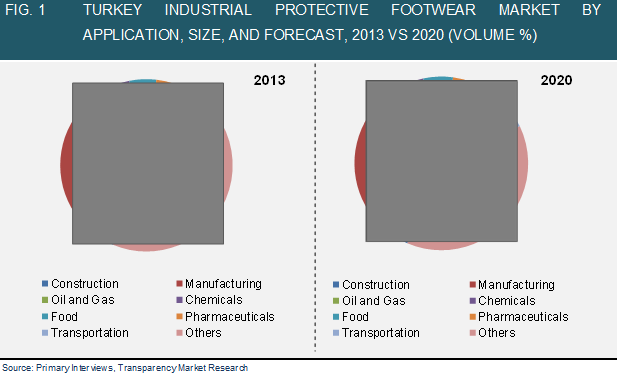 The report provides strategic analysis of Turkey and Russia industrial protective footwear market, and the market growth forecast for the period 2014 to 2020. The report includes competitive analysis of various market segments based on application and in-depth cross sectional analysis of the industrial protective footwear market across Russia and Turkey. In addition, the report provides average selling prices and volume across Russia and Turkey. Moreover, average selling prices and volumes are provided across each of the application segments in each of the countries providing support for analyzing the market potential across application segments. In addition, to support strategic decision making the report also includes tariff and non-tariff barriers present in Russia and Turkey. The report also provides major players in the industrial protective footwear market across Russia and Turkey. These factors establish various current trends and their impact on market size. Overall, the report takes into account a complete analysis of industrial protective footwear market, and provides an estimated growth for the period 2014 to 2020, considering the various factors affecting the market.